When the wet weather arrives it might be good for the garden but there is also the onset of slugs and snails to contend with. 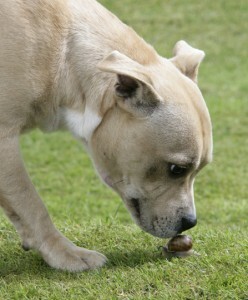 Slugs and snails are a nuisance at the best of times, but dog owners in particular worry about them as a dog can become very ill after eating them; as dogs tend to do. Food that has been left on the floor after a barbeque, or pieces of bread for birds, should be swept up as slugs and snails will help themselves during the night. This will leave your garden covered in their trails, and your dog vulnerable to his curious nature. If you have plant pots, glue a strip of copper around the base; slugs will not climb over copper. You can also place clumps of lava rock in a flower bed to form a barrier to stop slugs feeding off your plants. When the weather is warm, cool your plants down by watering them in the morning, as watering them at night encourages slugs to come out. There are many different slug traps available. Homemade ones that work include a flower pot over turned with one small stone propping it up. Place a small piece of grapefruit underneath this. In the morning there will be a group of slugs in and around the flower pot, however it is essential that you remember to remove them before you allow your dog out as he will probably try to eat them. It is important that you do not leave slug pellets around the garden as they are considered to be toxic to all breeds of dogs. Thank you for publishing this. I am sure that it will be a great help to a friend who has a serious problem with her much-loved dog and his liking for the creatures.